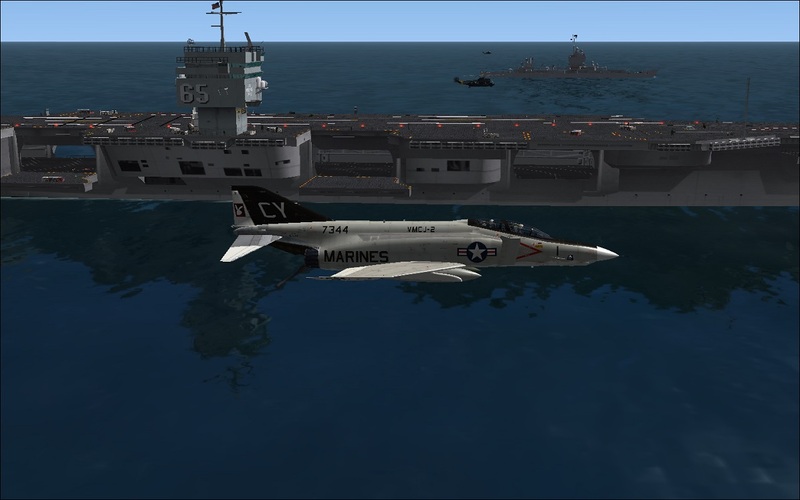 Description: CVN-65 nuclear battlegroup and aircraft, featuring: Alphasim (www.virtavia.com) CVN-65 scenery object converted to FSX AI with acceleration features. Slippery frames, looks pretty good for her FS8-9 vintage. CGN-9 Long Beach, CGN-42 Strike cruiser, SSN-585 Skipjack class SSN, AI SH-2 and SH-3 for escorts. The Skipjacks are dynamic and submerge/surface on start/stop. Alphasim RF-4 in FSX native, all animations-rudder, NLG, roll spoilers and feel ailerons- correct in sense and direction, drop tanks on fuel load/payload conditions, uses piglets F-1 VC. Willy Vernike's HSS-1 Seabat. FSX native, Alpha S-55 VC merged in. Looks allright, great for 60's navops. A big B-Z to Phil at Virtavia, Henk, Piglet, Dan the Man and Mr.Hatt. Grateful for this and your other FSX conversions Lazarus - thanks. My apologies to anyone who finds this thread and wants to download the initial package. I asked Dave and Rami to remove the file. agreement between Team SDB and Carl Edwards. The FS9 version by Team SDB was available for purchase until a couple years ago but was not made available as freeware once taken off market. The FSX/P3D version, and the upcoming Final Cruise version, are both based on the FS9 hull. The resulting and potential lost sales are why I had it removed from SOH Library and other places I have found it. We have no issue if the ship MDL is removed and the package re-uploaded.